Remember the butterfly garden Easter bonnet I posted about making the other day? 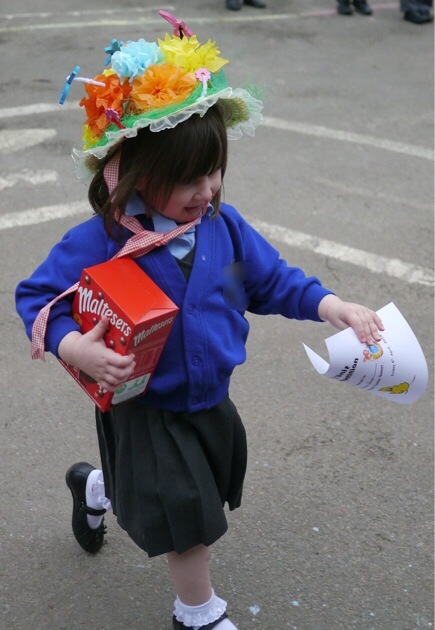 Well today was the school nursery Easter parade, which saw G marching and singing with her classmates, and…winning the Easter bonnet competition! Now I don’t like to admit to being competitive, but, well, who isn’t just a little bit? So I did feel a little vindicated in spending most of Saturday afternoon making those darned flowers, and cajoling G into designing and making it with me. The kids (and parents) had clearly put lots of effort in, and I should add that there were actually three winners, one for each group. I had a big grin on my face watching my biggest girl sing, dance, and flap her arms like a chicken with all her friends as they sang their way through such classics as ‘chick chick chicken’. And so begins the Easter holidays – the first time I’ll actually have to fully entertain two children for a whole week on my own, before we go off on a little holiday next week. Eek! that is a pretty fantastic hat! Decorating hats is new to me (we do eggs in the states) so ‘I need to learn some tricks! She is absolutely adorable! Best survival tip for easter holidays? Run away! !! Haha! It might come to that! Haha, I try to tone down my competitiveness as much as I can, and I do think it’s very much friendly competition, but it does sneak through occasionally! Love it Rayne. Mine will too and I know for sure Mr P’s will so our kids have no chance not to have it in them. lol Poor things.